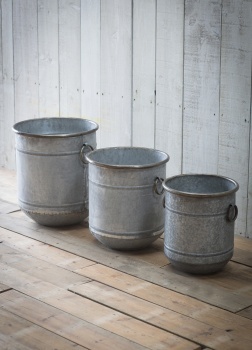 Made from galvanised metal, this Set of 3 Galvanised Malmesbury Planters is designed to be weather resistant as the pots are made from galvanised metal and come with recycled rubber handles, making them easy to lift and move into place. Stylish by the front door or on the terrace, planted up and used in a stunning display, this set of planters is perfect for any garden. Who could resist their old fashioned charm?